SCHIPHOL AIRPORT 19 February 2018 – The take-up of logistics real estate in 2017 constitutes an all-time height. Measured by buildings covering at least 5,000 sq m, take-up rates climbed to 1.84 million square meters which is in an increase of 18 percent compared to 2016, which already was an excellent year. 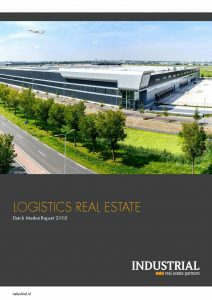 This is the conclusion of the most recent research report “LOGISTICS REAL ESTATE, Dutch Market Report 2018” published by INDUSTRIAL real estate partners. The brokerage firm with 3 offices in the Netherlands, specialized in industrial and logistics real estate, annually registers all occupier and investment transaction as of 5,000 square meters. Remarkable were the great number of speculative developments in 2017. Large scale distribution centers were developed and acquired by investors in cities like Born, Hoofddorp, Schiphol, Moerdijk, Nieuwegein, Roosendaal, Schiphol, Tiel, Tilburg and Vianen. The total investment volume in logistics real estate increased with 30% in comparison to 2016, up to a new record level of 1,31 billion euro. Because of the great interest of investors yields dropped under the 5 % for core product on prime locations.